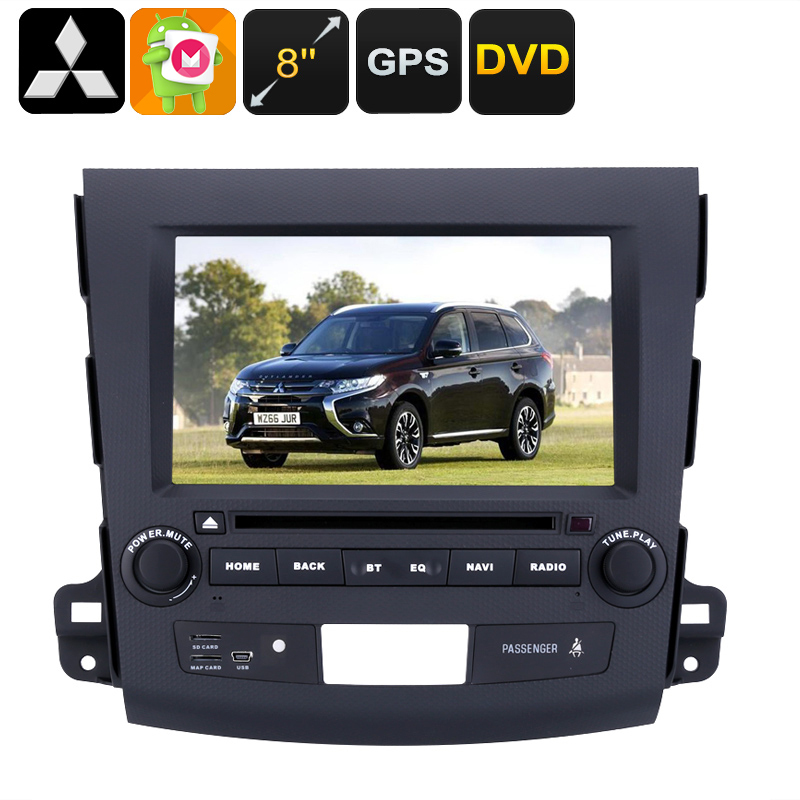 Successfully Added 2 DIN Car DVD Player Mitsubishi Outlander - 8 Inch HD Display, Android OS, Quad-Core CPU, Region Free DVD, 3G&4G Support, GPS to your Shopping Cart. This 2 DIN car DVD player is the perfect car accessory for anybody out there that wishes to pimp up their Mitsubishi Outlander. Coming with a large 8 Inch HD display, this dual DIN DVD player for in your car is guaranteed to keep your passengers entertained throughout your upcoming road trips – ensuring that there’ll never again be a single moment of boredom in your car. So much more than a regular car DVD player, this in-car media player runs on an Android operating system. With access to the Google Play Store, it provides your passengers with countless hours of non-stop media entertainment. Watching movies, playing games, or browsing the web – this two DIN car DVD player is guaranteed to meet all your in-car media demands. Packing a sophisticated Quad-Core CPU, this Android media player is capable of handling mobile games, movies, and applications without dropping a frame. Additionally, it features a region free disc drive – allowing you to watch any DVD no matter where in the world it’s purchased. Supporting Bluetooth connectivity, you’ll have the possibility to pair this Android car DVD player with your smartphone, tablet, or laptop – allowing you to listen to your favorite tracks stored on your mobile device through your car speakers. Additionally, it also supports AM and FM frequencies to meet all your regular radio demands. Along with its DVD player and Android media capabilities, this 2 DIN car DVD player furthermore features a highly accurate GPS system. With this 20 channel GPS navigation system at your side, you’re guaranteed to reach your upcoming destinations in the fastest and most efficient manner without ever needing to worry about getting lost again. Supporting Android maps, you’ll be able to simply install any regional map required via its 64GB TF card slot, ensuring that no matter where on the globe you’re located; you’ll always be provided with real-time and accurate traffic information. Whether you use it to entertain your passengers with games and movies, listen to your favorite tracks in stunning audio quality, or use it for navigation purposes – this dual DIN car DVD player is guaranteed to meet all your on-the-road demands. As the perfect in-car Android media player, this car DVD player makes sure that your passengers will never experience a moment of boredom again while waiting to reach the destination of your upcoming road trip or holiday. This Android car DVD player comes with a 12 months warranty, brought to you by the leader in electronic devices as well as wholesale electronic gadgets..
Arabic: - مشغل دي في دي السيارة 2 - Chinese Simplified: - 2 车载 DVD 播放器 - Czech: - 2 auto DVD přehrávač - Danish: - 2 bil DVD-afspiller - Dutch: - 2 auto-DVD-speler - French: - Lecteur DVD de voiture 2 - German: - 2 Auto-DVD-Player - Hebrew: - נגן DVD לרכב 2 - Hindi: - 2 कार डीवीडी प्लेयर - Italian: - DVD per auto 2 - Japanese: - 2 車の DVD プレイヤー - Korean: - 2 차 DVD 플레이어 - Malay: - Pemain DVD 2 Kereta - Norwegian Bokmål: - 2 bil DVD-spiller - Romanian: - 2 DIN Car DVD Player - Russian: - 2 автомобиля DVD-плеер - Spanish: - 2 reproductor de DVD - Thai: - เครื่องเล่นดีวีดีในรถ 2 - Turkish: - 2 araba DVD oynatıcı - Vietnamese: - 2 xe máy DVD.